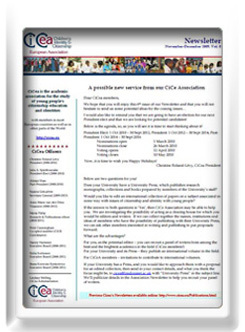 6 CiCea Newsletters are published a year. The Research Competition for 2009 was opened! See the Activities page for full details. The Executive met in Mechelen, Belgium in January 2009. Plans were made for the Journal, for the Research Competition and for the Annual General Meeting in Malmo. The Association Executive met in Oradea, Romania in October. They made arrangements for the Company and Charity reports to be filled, with the relevant annual accounts. These will be given to Association members at the Assembly meeting in May 2009. The Executive plan to publish the first electronic Newsletter in November 2008. This will then be published regularly through the year. The first Newletter will contain details of the next Research Grant Competition. Arrangements were also made to ensure that the Association's administrative arrangements are put on a regular basis. The Annual General Assembly was held in Istanbul on May 31st 2008. 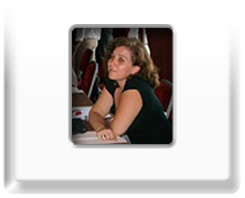 The Executive nominated Susana Goncalves to be Association Secretary for one year from 1st October 2008. Meeting on May 31st 2008 in Istanbul: the Exceutive present their Annual Report. Beata Kryswosz-Rynkiewick; Julia Spinthourakis (Secretary); Alistair Ross (President)[standing]; Christine Roland Levy (President-elect); Marta Fulop; Anne Marie Van den dries (Treasurer). The Annual General Meeting was well attended. The draft minutes are published on the web site (see Meetings/Conferences). The Meeting accepted the election results for the new executive, and agreed to he nomination of Susanna Goncalves as Secretary (for the year 2008-9, to fill the vacancy resulting from Julia Spinthourakis becoming President-elect in October). This picture of the Assembly shows a small section of the meeting, with (right foreground) Lindsay Melling, the Association administrator, taking minutes. Three proposals were received, and after deliberation the Executive has decided to award the 2008 grant to a proposal byMaria Pagoni (University Lille III, France), Despina Karakatsani (University of Peloppenese, Greece),Richard Etienne (University of Paul Valéry Montpellier III, France),Georges Stamelos and Julia Spinthourakis (University of Patras, Greece) for a project entitled: Curricular, Pedagogical and Didactic Questions about Participative Citizenship in Secondary Schools: a comparison of two European countries. Nominations for Executive Member posts opened in late January. The Assocation is to offer groups of Association members research grants to support collaborative projects. The first grant/grants will be for up to 1,500 Euros, for a group of four or more Association members (from different Institutions). Applications are due in March 2008: details on the Activites page. Nominations open this month for the President-elect/President election. The person elected will join the Executive as President-elect next October, and become President at the end of Christine Roland-Levy's term of office (September 2010). They will be President for two years, and then past-President for two years. Nomination details on the Activites page. Welcome to the new CiCea website, which was put together 22 - 26 June. It will replace the temporary site on the CiCe Thematic Network site. We puchased our own domain name - with the all-important .eu address. Voting for these posts will be in April, with the results announced a few weeks before the Istanbul conference. These four posts will only come into effect if we are funded for a fourth CiCe Erasmus Network from October 2008. If our proposal is not funded, we shall not be able to afford this many Executive posts. There was only one candidate nominated for election as our next President. Christine Roland-Levy, of the University of Paris Descartes, is elected as President-Elect to September 2008, when she will become President of the Association for a two-year term. Following this she will continue as Past President as a member of the Executive until September 2010. The European Commission supports the CiCe Thematic Network for a fixed term to carry out particular activities agreed with the Socrates agency. To date Socrates has supported the CiCe Network for four separate periods (1998-2001; 2001-2; 2002-5; 2006-8). The CiCe Association is independent of the European Commission, and will have an existence independent of the Commission. It will nevertheless continue to seek funding for Network activities from the Commission beyond 2008. We coordinate a European Commission Erasmus Network: click on the logo below to visit the Network site. We publish a regular academic journal, and other publications.